It’s been almost four years since my last stay at the Grand Hyatt Melbourne, and this time I’m back with the whole family. Travelling with a little one is very different to travelling by yourself or as a couple as most parents out there will relate, so how well did the Grand Hyatt stack up? A week prior to our stay, I contacted Concierge to see if we could arrange a connecting room and received a positive response within 24 hours (off to a good start!). On arrival, the friendly porters were readily available to take care of our luggage, the car (valet parking is $55/day), and directed us to level 2 for check-in. Staff behind reception continued the warm welcome and diligently got us checked-in all the while engaging in a friendly conversation. We were also able to request on our friend’s behalf to stay on the same floor as us as their flight was scheduled to arrive later that evening. Despite having 550 guest rooms, thanks to its height, natural palates and textures, the light and airy lobby felt tranquil. Plus it gave our curious little two year old plenty of spaces to explore around. The touch screen controls in the beautifully refurbished lifts immediately brought the well-established hotel into the future, and transported guests into the moody-toned corridors leading to the guest rooms, perfectly emulating the transition from work and play, to rest. Our two connected standard king bed rooms located on Level 16 were decently sized at 33 sqm each and gave everyone enough space to spread out in comfort. The King bed along with its Egyptian cotton linen ensured a good night sleep. Unlike quite a few Australian five-star hotels, it was great to see bottled mineral water and slippers supplied (probably an indication of a large Asian clientele). Housekeeping had to unlock the connecting doors, and as they did, we saw them remove a mattress/foam sandwiched between the doors that helped reduce noise which I thought was very thoughtful for guests not needing the connecting rooms. The rooms we had offered a skyline view of Melbourne and overlooked the roof-top tennis court, basketball area and golf range. Free WiFi was available unlike another serviced apartment I stayed at recently that only offered 30 mins free WiFi per 24 hours! I mean, if we get free Wifi 30,000ft in the air these days, it’s pretty lame that it’s not available free for guests on the ground! A sumptuous buffet breakfast is served in the signature restaurant – Collins Kitchen, offering a contemporary dining space with three main zones of hot, cold dishes, and a pastry bar. Plenty to choose from even for the sometimes little fussy ones, and high chairs are readily available. The 24/7 fitness facilities are certainly above and beyond through the public-membership based City Club Health & Fitness. The Club has no less than three fitness studios, dedicated weights and cardio zones along with an indoor heated swimming pool (on the small side), jacuzzi, spa, and separate male and female sauna and steam rooms (wet areas open during certain times only). Being a membership based Club you would expect a larger crowd but not to worry, there is plenty of space to spread out. If working out is a must during your stay in Melbourne, then the City Club alone is enough reason to justify your stay at the Grand Hyatt. Chanel, Louis Vuitton, Gucci are all steps away! 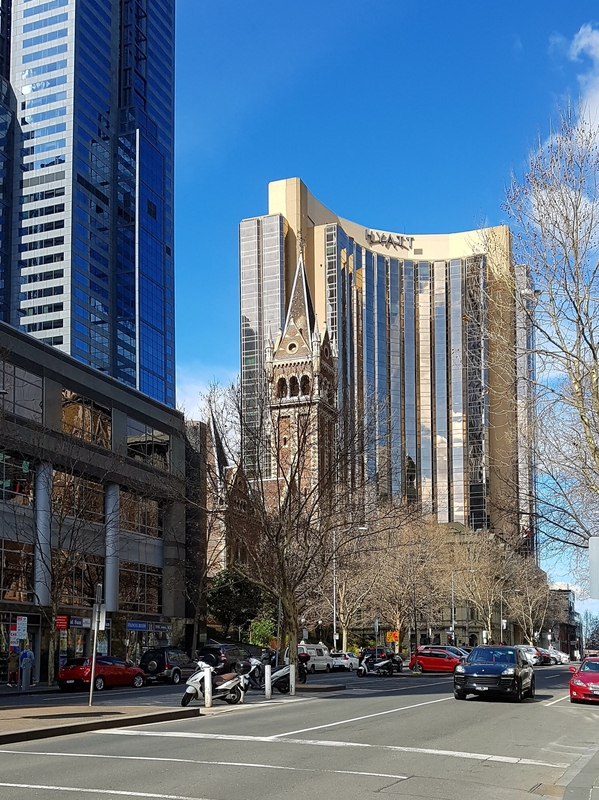 One of the ‘down-sides’ or upside, depending on which side of the fence you’re on, is the hotel’s location in the Paris end of Collins St and its proximity to the array of high-end fashion/jewelry retailers like BVLGARI, Chanel, Emporio Armani, Gucci, Louis Vuitton, and Paspaley. Other than that, you can’t really fault the location. It’s a 5-10 min walk up to Bourke Street Mall or a 5 min roll down the slight slope to Federation Square and Flinders Street Station. Helpful and friendly staff, inviting atmosphere, attention to detail, luxurious interiors, outstandingly balanced and in sync ‘hardware’ and ‘software’ creates a truly five star guest experience for the entire family.